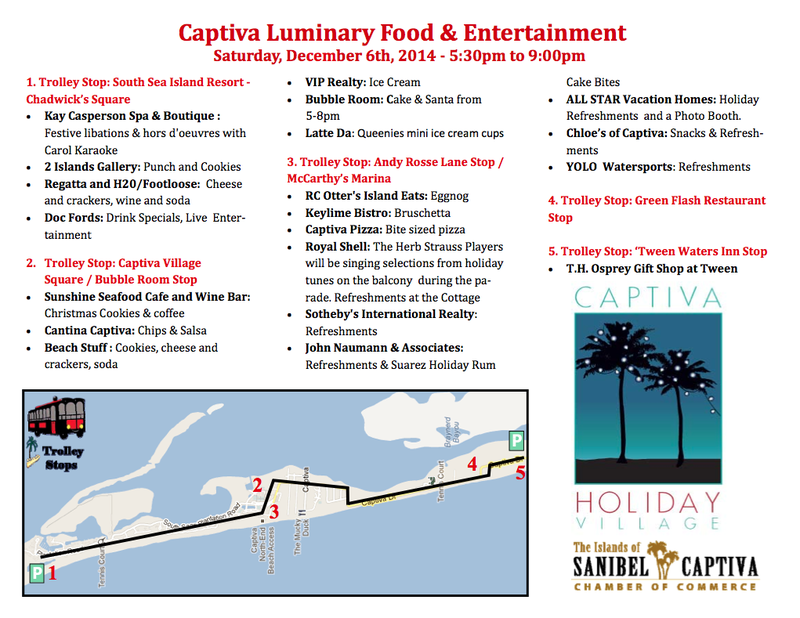 Day 5 of 100 Things to do on Sanibel & Captiva takes us to the Captiva Luminaries Festival on December 6, 2014. 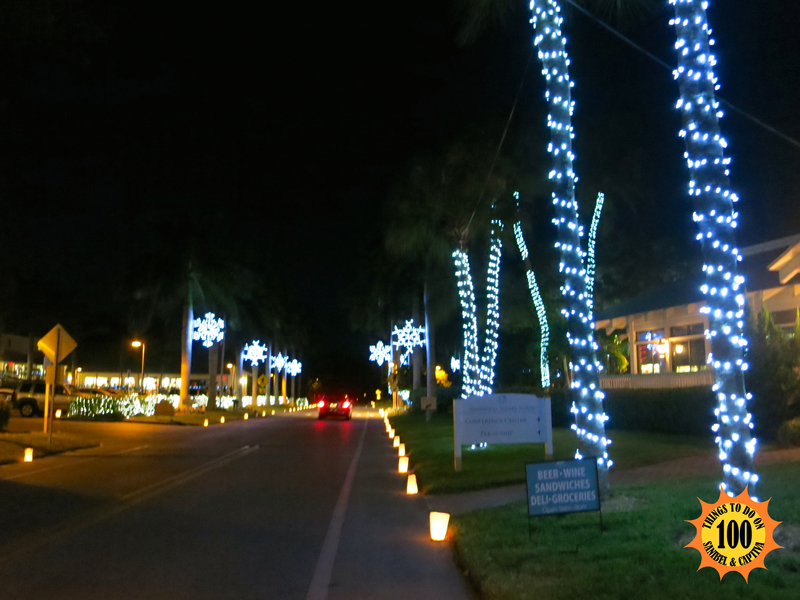 This annual event takes place along Captiva Drive & Andy Rosse Lane with luminaries lining the roads. Businesses and restaurants will be open giving out food and drinks and shops will be having great sales! Definitely stop along Andy Rosse Lane. The whole street turns into a huge holiday party! If you get a chance grab a bite to eat at Doc Fords then grab an Orange Crunch Cake to go from The Bubble Room. Try to carpool and if you have a friend on Captiva, see if you can park at their house. There is little to no parking along the trail so when you find a spot, leave it there walk around or take the Trolley then come back at the end of the night. Click the map below so you can download and print it. 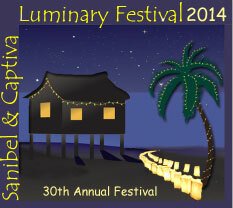 For more information be sure to check out the Captiva Luminaries website. 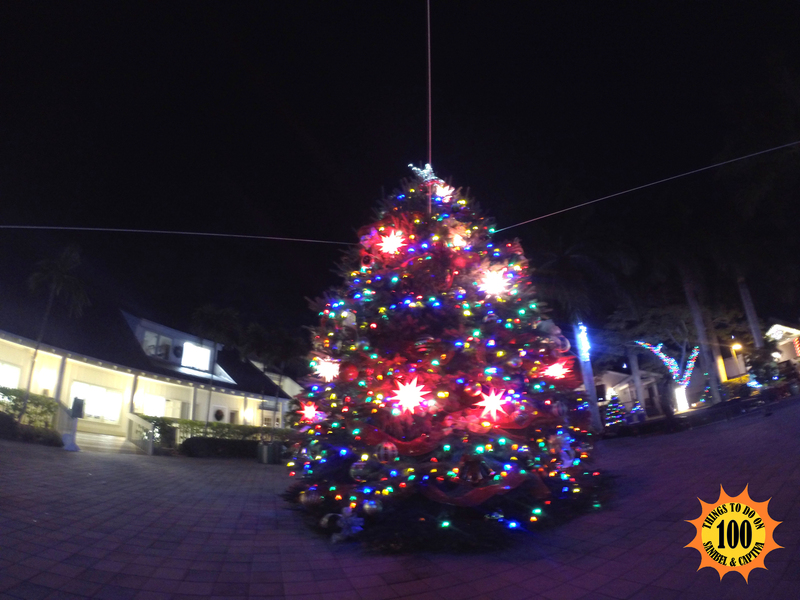 Check back after Captiva Luminaries for videos and photos we took from the event! Be on the lookout for us with our GoPro camera filming! 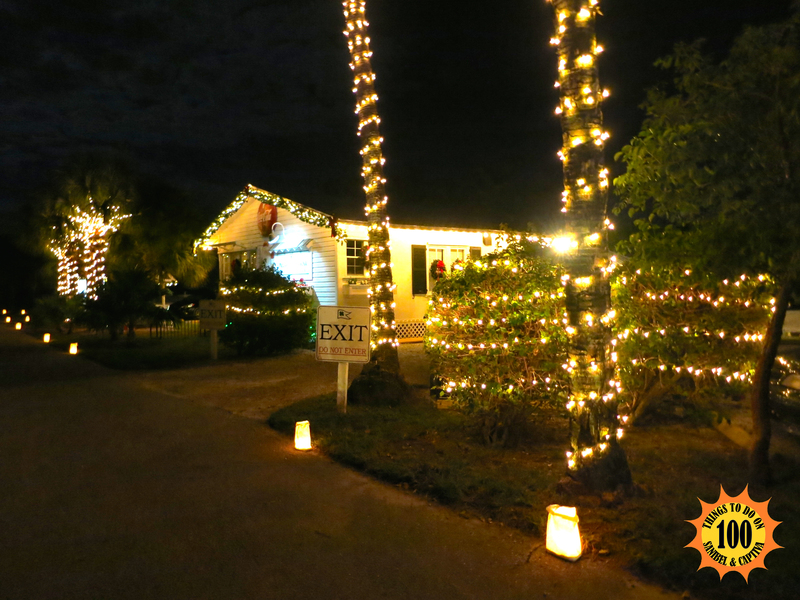 We had a great time at Captiva Luminaries! We parked in front of Doc Fords on Captiva, enjoyed their beautiful tree and began walking towards Andy Rosse Lane. The roads were lined with luminaries (paper bags filled with sand and a lit candle) and beautiful lights and decorations. We were lucky that it was a few degrees cooler than the night before at Sanibel Luminaries. We stopped at The Bubble Room, which was giving out free Red Velvet Cake! It was very festive looking! 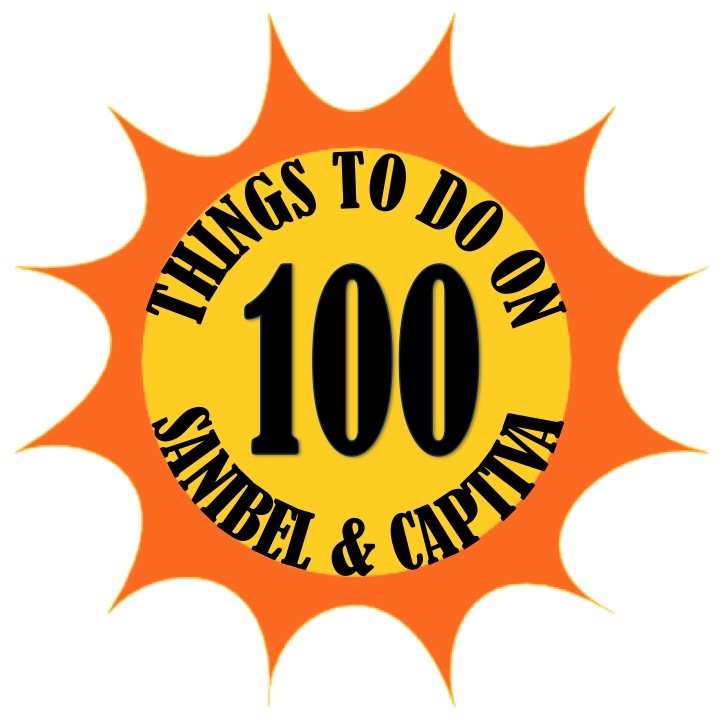 Now we will definitely be featuring The Bubble Room on 100 Things to do on Sanibel & Captiva, but if you haven't been go and try their Orange Crunch Cake! 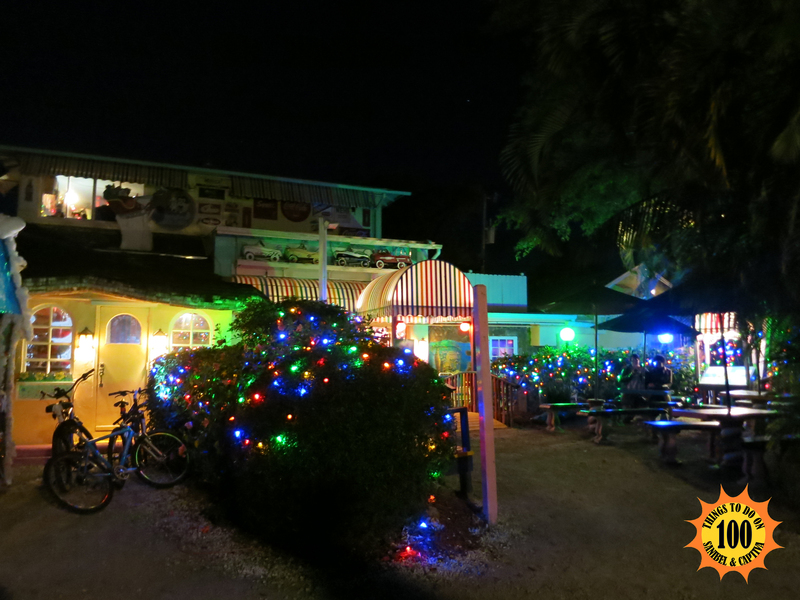 Now, I would say that it seemed like there were fewer people than in years past at Captiva Luminaries. But we had a great time walking around, and eating and drinking along Captiva and seeing all the beautiful decorations!